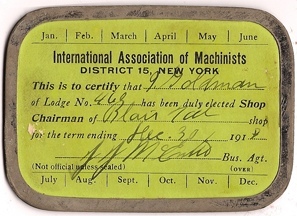 Notes: Originally Mr. Gillig was initiated as a Machinists Helper, but apparently at some later point “Helper” and the associated check-mark were scratched out and “Journeyman” was checked, instead. 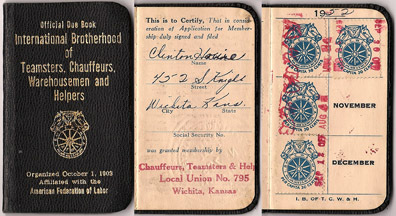 Notes: This was my first union object collected. I bought it from Antiques & Things on Central Avenue, just to the east of the 3-story antiques mall, while looking for Christmas presents. 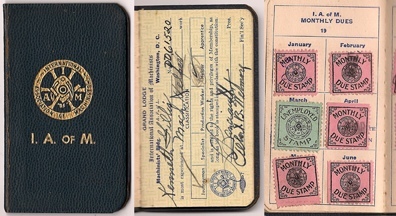 I had joined the IWW only a few weeks before. Notes: Mr. Goldman is noted as being a “Machinist” on the front page. Also see TAFC.2009.40 which notes Mr. Goldman as having the same member number, suggesting that IAM may be functionally connected to AMWA. Here, that number is only noted somewhat informally in pencil on front page. Uncertain! 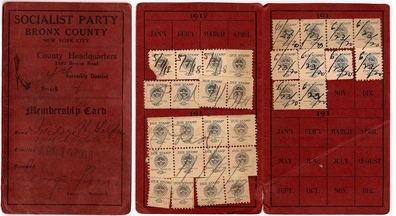 Stamps: Thirty-eight red and white monthly dues stamps, with dark blue year dates printed on them. Cover: Soft tan card cover. Stamps: One green and white Renewal stamp, forty-eight orange and white monthly dues stamps, four Convention Assessment stamps at 50¢ each. 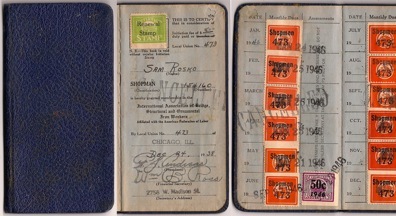 Notes: Notes in back show that Mr. Rosko was initiated into the union in 1937, reinitiated in 1938. 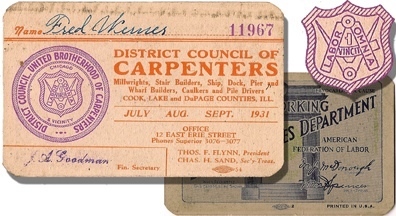 Mr. Rosko is classed as a Shopman, and all of his dues stamps are so marked. Each is canceled with an ink date stamp. Every page is stamped CANCELLED. Stamps: One hundred and twenty red and pink 25¢ monthly dues stamps; forty blue and black quarterly (?) 25$ assessment stamps; one red and white Special Assessment McNamara 25¢ stamp; four green and black Anti-Prohibition $1 assessment stamps. Notes: A large booklet. All text is in English in standard type, as well as in German in traditional Prussian font. 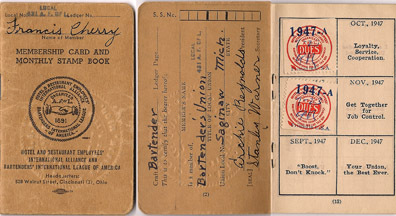 Mr. Granauer is noted as being born in Germany, March 22, 1874, initiated into the union on July 5, 1908, into Local 163. This is a prized dues booklet. Won on eBay. Notes: Probably the most expensive dues card I ever bought. Purchased on eBay. Bidding war, as I recall. Cards from explicitly women’s unions are rare, and the bidding war in which I took part would confirm this. 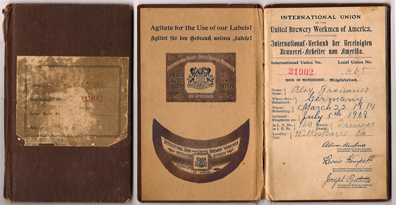 The ILG is an extremely important union in American labor history. 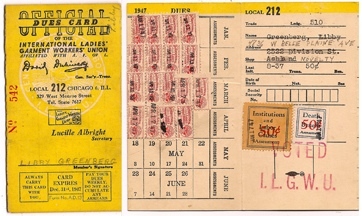 The ILG grew considerably in power and prominence after the Triangle Shirtwaist Fire of 1911, working both within the labor movement and in concert with Tammany Hall, making strides in comprehensive safety and workman’s comp laws. Signed by JJ McE [illeg], Business Agent. 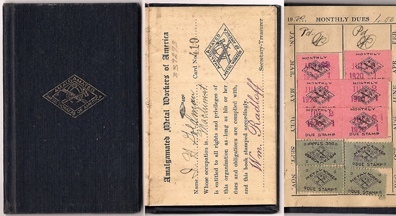 Notes: Not embossed with IAM seal (“Not official unless sealed”) Documents that Isidore Goldman was Shop Chairman (attends Chairmen meetings, checks members book, tracks wages paid, confers with employer when necessary, notifies union business agency when men are needed, reports on shop conditions) for 1919 (?) at the Blair Tool and Machine Shop. This is a heavy card with a metal strip running around its outer edge. Notes: One of three such cards for Mr. Masters. 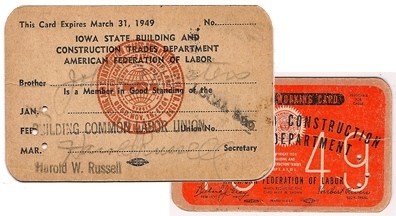 Stamped “Building Common Labor Union.” Signed by Harold W. Russell, Secretary.